Solomon Islands Prime Minister Manasseh Sogavare led a 15-strong delegation to Taiwan on Monday to visit President Tsai Ing-wen and other officials. The delegation, which will stay in Taiwan until September 29, will call on the president as well as Legislative Yuan Speaker Su Jia-chyuan and Minister of Foreign Affairs David Lee. According to a press statement from the Ministry of Foreign Affairs (MOFA), Tsai will host a military salute and a reception in Sogavare's honor. The Solomon Islands has long supported Taiwan's participation in the international community. At the general debate of the U.N. General Assembly earlier this year, Sogavare spoke of the collaboration between the two countries in the fields of health and sanitation, education, clean energy and agriculture. 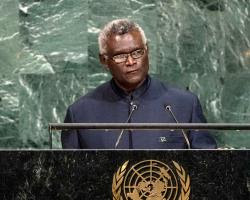 Sogavare spoke on behalf of Taiwan's 23 million people who, he said, have been ignored by the U.N. and he asked the international organization to acknowledge Taiwan as a member, especially given the country's willingness and readiness to contribute to human welfare. The visit marks Sogavare's fifth visit to Taiwan and his third as prime minister.